In 1978, an almost century-old dream became a reality. Louise Joy Brown, the first successful in vitro fertilization (IVF) baby, was born in Oldham, England, thanks to the decade-long efforts of obstetrician-gynecologist Patrick Steptoe and physiologist Robert Edwards. The news was greeted with cheers by childless parents and derision by some church leaders accusing them of “playing God.” At the time Edwards was awarded the Nobel Prize in 2010 (Steptoe was deceased), an estimated four million “test tube babies” had been born. Louise Brown conceived and delivered a child naturally in 1999. The genesis for IVF started at Cambridge University in 1891 when Walter Heape successfully transplanted embryos into a rabbit, which gave birth to a litter of six. In 1934, reproductive biologist Gregory Pincus (co-discoverer of the oral contraceptive decades later) and E. V. Enzmann at Harvard first proposed that mammalian eggs could undergo normal development in vitro (outside the body). The notion of creating embryos in laboratories appeared two years earlier in Aldous Huxley’s Brave New World. Fiction was realized in 1959, when M. C. Chang, a reproductive biologist at the Worcester Foundation for Experimental Biology, was the first to achieve IVF in rabbits after fertilizing newly ovulated eggs with sperm in a flask. IVF seems relatively simple in principle, but optimizing conditions for successful fertilization took Steptoe and Edwards ten years to perfect. Normally, women produce a single egg each month. In IVF, fertility drugs are used to induce “super ovulation,” causing release of multiple eggs. The eggs are retrieved from the woman’s ovaries by the process of follicular aspiration. If no eggs are produced, donated eggs can be used. Sperm and the egg(s) are mixed (insemination) in vitro, with the egg usually fertilized after several hours; sperm may also be injected into the egg (intracytoplasmic sperm injection or ICSI). The fertilized egg divides, becoming an embryo, and is permitted to incubate in a flask where, after 3–5 days, it is implanted into the uterus. The success rate of giving birth to a live baby after IVF decreases with age: 41–43 percent for women under thirty-five and 13–18 percent for those over forty-one. SEE ALSO: Placenta (1651), Spermatozoa (1677), Theories of Germination (1759), Ovaries and Female Reproduction (1900), Timing Fertility (1924). 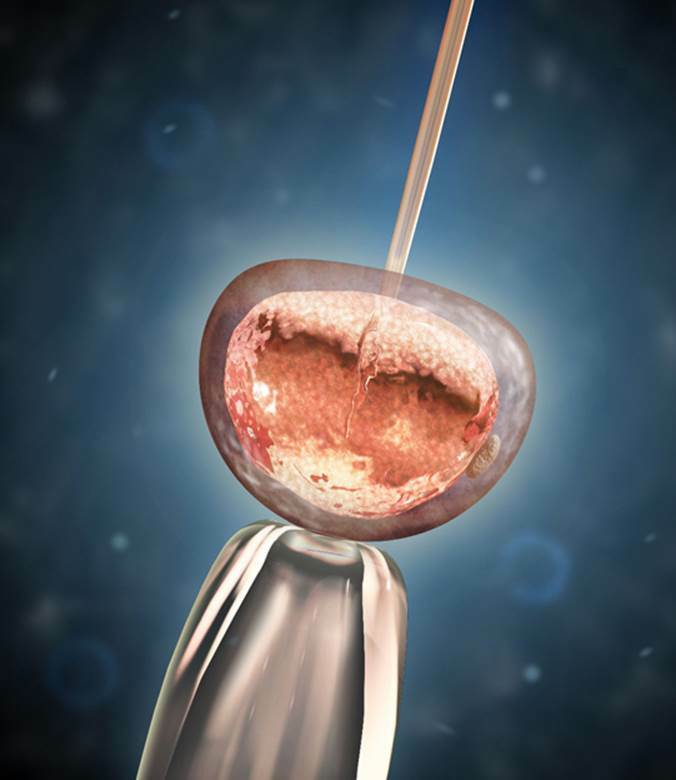 In this digital illustration, a glass needle injects sperm into an egg extracted from a woman’s ovary during IVF.